It is without a doubt the question we are asked the most. Whether it concerns palm trees or banana plants, there is often a lot of uncertainty about the correct dosage when it comes to the irrigation. Therefore, we thought it would be useful to devote a special article to this item. This way, the plant can never have too much. After all, roots absorb water as needed, just as they would in the ground with groundwater. Compare it to a cigarette paper partially suspended in water. Another advantage is that the top layer of the soil remains dry and no fungi or sciarid flies nest there. For some plants, it is advisable to fill the saucer only once a week so that the saucer can dry in between and the roots do not remain permanently submerged. During the winter months, it is advisable to take even longer breaks, for example every 2 to 3 weeks. Pour water over the entire surface until it begins to flow into the saucer. Take small breaks in between so that the saucer does not overflow. If the saucer is emptied by the plant within 48 hours at the latest, that’s fine. If it takes longer, empty the excess and wait a little longer next time. If the saucer is empty after a few hours, give a little more. Unfortunately, this often also applies to the many, of course always well-intended, opinions. It is not uncommon to get very contradictory advice from the local garden centre, the plant label, books or the internet. The reason for this is quite obvious; no plant is the same and this also applies to the conditions in which you keep the plant. After all, it is not only the plant itself that determines its water needs, but a number of other factors are at least as important. And it is precisely these factors that can differ greatly. There is therefore no standard answer to the main question of this article. Which factors influence water needs? Of course, it is important to know the basic needs for general care of your plant to begin with. Some plants prefer to be kept a bit drier, while others do better in more humid soils. The best indication is to check the plants natural habitat. It goes without saying that plants from desert areas are better kept dryer and vice versa. In addition to the natural needs of the plant, the size of the plant also plays an important role. A large plant with a lot of leaves will evaporate more water than a smaller plant with only a few leaves. Larger plants are also more likely to have a better developed root system, so that water will be absorbed much better. With a smaller plant, the soil will remain wet longer as there are fewer roots for water absorption. In addition to the characteristics of the plant itself, the location also plays a very important role. For instance, plants outdoors require a different approach than plants indoors. Outside the plants are exposed to sun and wind, but also to rain or drought. The wind in particular can cause a strong increase of evaporation. Plants in pots also need more water than plants in the open because the potting soil can dry out faster. Indoors, the conditions are much more stable, so you will quickly discover a fixed pattern in the needs of your plant. 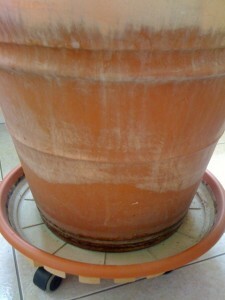 The type of pot has an important influence on the water requirements of your plant. Stone pots (pottery) does evaporate moisture through the side walls, which causes the soil to dry out faster. However, with this kind of pots you can see by the color difference where the soil is still wet. This makes it a little easier to assess the need. In plastic containers, the soil remains slightly wetter because moisture can only evaporate through the top layer. So choose the type of pot consciously and use their characteristics to your advantage! The type of potting soil can also play a role. 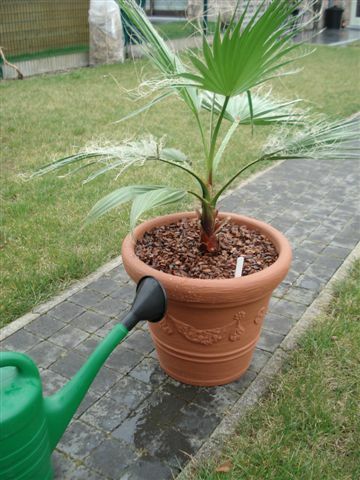 There are many different types of potting soil available on the market with different water retention characteristics. Finally, it is also important to take into account the season. Most plants need a resting period which starts in the autumn when the days shorten and the temperature falls. This will also lead to a sharp drop in water needs. In spring, the plants start to grow again and the irrigation may be gradually increased. The explanation in the article does not only relate to palms, but actually applies to all plants. Banana plants, however, are an exception to the rule. After all, these plants are largely made up of water (80%). They also have a large leaf area. This makes them evaporate a lot of moisture on sunny and/or windy days. They therefore need a lot of water! However, this only applies to banana plants that grow well. As long as there is no growth, they should be kept dryer to prevent root rot. In the winter, they hibernate and need much less water. In this period, more banana plants encounter problems due to too much water than too little. Some species do not even need water at all during the whole winter season (e. g. Ensete). So there is no standard answer to the question “how much water does my palm tree/banana plant need”. Of course, there are ways to control the water needs of your plant. 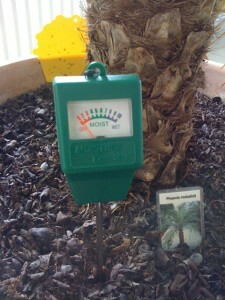 The easiest way is to check the humidity of the soil by inserting a finger in the potting soil. After all, the surface dries out quickly due to direct contact with the air, but just below the conditions can be very different. So feel a finger deep to control. 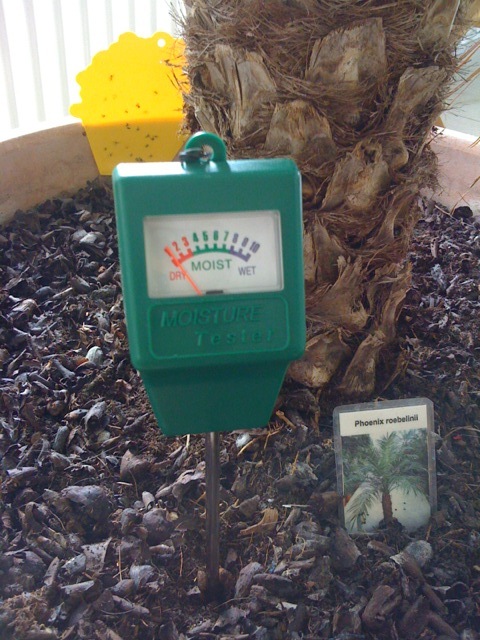 If the soil sticks to your finger, the soil is still moist and a new irrigation will not be needed immediately. There are also so-called humidity meters. These devices are not expensive (about €7, -) and are sold in the local garden centre. This sensor allows you to check the humidity a lot deeper and more accurately than with your finger. You will be amazed at how wet the potting soil will be a lot deeper! However, a humidity meter should not remain permanently in the pot and must be cleaned thoroughly after each use to prolong its service life. Instead of a humidity meter you can of course also use a long knitting pen or a bamboo stick, etc., but be careful of the roots. Finally, we would like to give you some tips. It is better to water every so many days than every day a little. Drainage is also very important. If the water excess cannot flow away, you risk root rot. Very few plants like standing permanent in wet conditions. Let the soil dry before watering again and pour the excess water out of the saucer. In case of doubt, it is best to remove the plant from the pot to inspect the root ball. Healthy roots are white-yellow colored and do not smell rotten. This way you also immediately see the humidity of the soil.